The United States Coast Guard is the branch of US Armed Forces. US Coast Guard is a part of country's uniformed services, total number of which is seven. The Coast Guard is a maritime service. As well it is a military service. The new stamp is dedicated to this important organization. William S. Phillips, famous artist, made oil paintings for the stamps. The first icon depicts the cutter Eagle (before it was called Horst Wessel). Future officers of the USCG train on this barque. It is vessel is of big importance in the US. The second icon depicts MH-65 Dolphin helicopter, the Coast Guard rescue aircraft. It is made of corrosion-resistant materials. Some pilots call this helicopter "Tupperwolf" or "Airwolf" for the composition of materials it's produced of. William S. Phillips was inspired by the work process on the stamps as his first love in art was aviation. His work on aviation theme is really outstanding. Phillips has numerous regalia and awards for his job. The Coast Guard started its activity in 1790, when George Washington ordained a law about a fleet of 10 boats. But modern name of the agency was received 100 years ago, when "Act to Create the Coast Guard" was issued by Woodrow Wilson in 1915. Of cause, the main responsibility of the Coast Guard is saving people lives at the sea. It is main, but not only responsibility. They have to enforce maritime law, to protect the maritime environment, to respond for water pollution, to carry out icebreaking operations, to guarantee security of port, to combat terrorism, to aid the defense of nation and so on. Many people work on these tasks in the USCG: about 38 000 active-duty people, about 8 000 people in reserve, and many volunteers. The art director of the stamp was Phil Jordan. 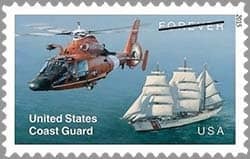 The stamps dedicated to the United States Coast Guard are Forever stamps (the stamps of the first class). Stamps stay valid despite of rate rise.